Carpets on Sale today at Portland Flooring & Carpet of Oregon City will include a textured plush, Saxony, Frieze, Berber and Commercial Carpet. 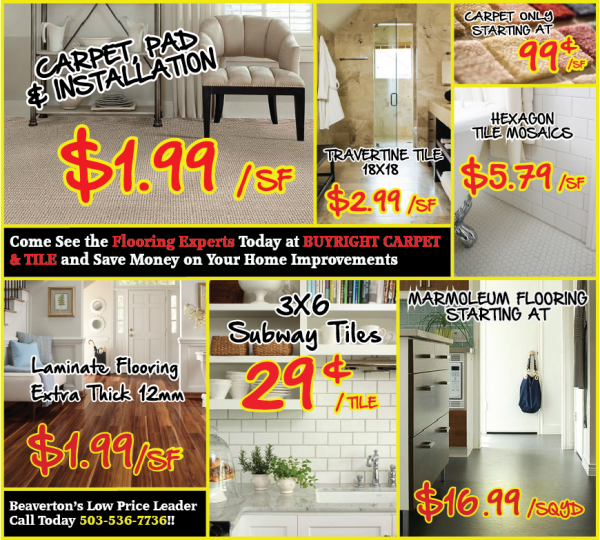 While our competitors advertise the lowest prices on carpet with “Carpets Sales” at 50% off, 60% off, 70% off, at Portland Flooring & Carpet of Oregon City we don’t mark our carpets up 50% to begin with. Our sale carpets are consistently 10% to 20% less than the sale carpets advertised at the big box stores, carpet warehouses, and outlet stores. Portland Flooring & Carpet of Oregon City’s Sale on Carpets include padding and professional store guaranteed installations. Most of our Sale Carpets are stocked in our local warehouse and upon request can be installed within 72 hours. Portland Flooring & Carpet of Oregon City is an Authorized Shaw Carpets Dealer and an Authorized Mohawk Carpets Dealer. The Carpets on Sale at Portland Flooring & Carpet of Oregon City are brand names with full manufacturer’s warranties so you can buy with confidence. Carpets for Sale at Portland Flooring & Carpet of Oregon City are offered with store guaranteed installations. Instead of handing our customer’s a list of installers, all our installations are estimated, sold and warrantied by our store. Call us today at (503)451-5353 or complete our online form to schedule an in home estimate/design consultation with one of our professionals.